Alexandra Exter (1882-1949) came from a wealthy Ukrainian family. Unlike many of her compatriots, she had frequent opportunities to travel to the main European cities in the prewar years. Exter was perhaps at her most effective as an artist in her theatrical work. 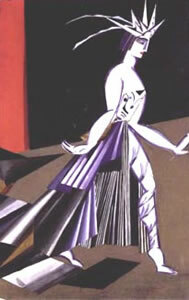 For Alexander Tairov's Chamber Theater she designed Thamiros Kitharodos, Salomé, and Romeo and Juliette. Equally famous were her extravagant costume designs for the 1924 Soviet science fiction film Aelita, Queen of Mars. 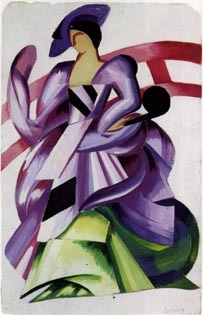 Exter immigrated to Paris in 1924, where she continued to work in the theater through the 30s. After Thamyris Kitharodos, Alexandra Exter went on the design two more productions for Alexander Tairov at the Chamber Theater in Moscow. On this page are three costume designs for the 1917 production of Oscar Wilde's Salomé. 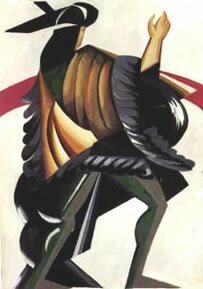 Exter's third production for Tairov was Shakespeare's Romeo and Juliet in 1919. 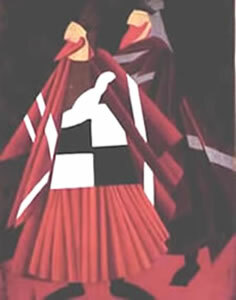 To the right we see two costume designs for that production in Exter's trademark style.